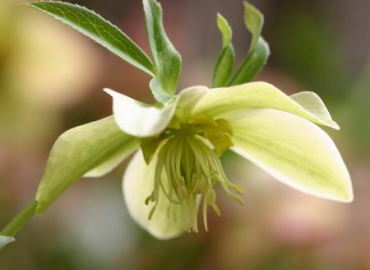 I first recognized the plant of H.liguricus as a species, in conversation with our hellebore guide, Will Mclewin on the 2006 tour to Croatia and Hungary. He said,“ The scent of H. liguricus is sweeter than that of H.odorus.”I have been interested in the plant since. 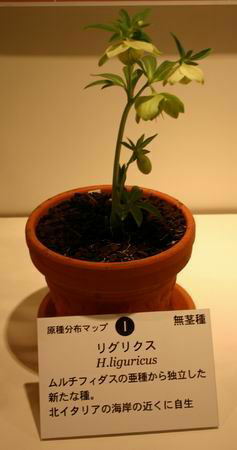 Fortunately, the plants of flowering H. liguricus (Photo A & B) were exhibited and sold for the first time at Sunshine City Convention Hall exhibition 2007. I became conscious of the scent of the plant there and recalled what I had learned in 2006. Therefore, it has become one of my favorite species. As H.liguricus is barely known to hellebore lovers in both Japan and other countries at the present time, I think many nurseries will try to cross some hybrids with it to produce more fragrant hellebores. “Much further north and close to the Italian west coast in Toscana and Liguria there are smaller populations of equally extreme examples of plants currently included in H.bocconei. For convenience we refer to these plants as ‘H.liguricus’. ＊Both quotes are taken from: Helleborus bocconei and the Hellebores of Italy by Will Mclewin, Brian Mathew and Matthias Thomsen, The Plantsman,New Series Volume 5 Part 4, December 2006.